The next seat in our A-Zdvent calendar is Robert Venturi and Denise Scott Brown's Postmodern interpretation of an eighteenth-century Queen Anne chair. Manufactured by American company Knoll in the early 1980s, the playfully patterned Queen Anne Side Chair was designed by the American husband-and-wife duo as a commentary on consumer society's desire for historic continuity. The Queen Anne furniture style was developed during and after the reign of the British monarch from 1702 to 1714. Robert Venturi and Denise Scott Brown squashed the silhouette of a typical side chair from the period and recreated the shape in bent maple plywood. 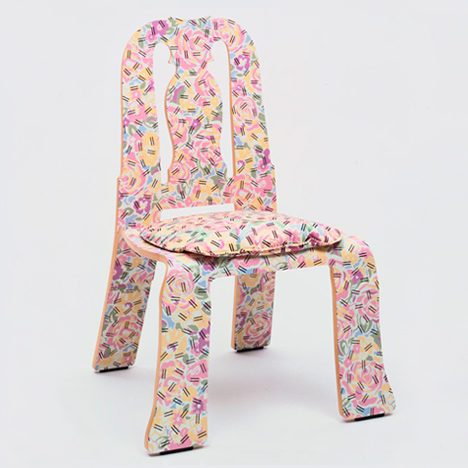 A plastic laminate on the chair's flat surfaces is covered with pastel colours and black dashes. The faux-leather cushion is also patterned with the same print, which was based on a mass-produced floral tablecloth owned by the grandmother of one of the duo's employees. Queen Anne Side Chair is one of a series of flattened historical chair designs by the Venturis, which range from Gothic Revival to Art Deco. The series is based on Robert Venturi's dictum "less is a bore" from his 1966 text Complexity and Contradiction in Architecture – a counter to Mies van der Rohe's Modernist slogan "less is more". The chair featured in the Designing Modern Women 1890-1990 exhibition at New York's Museum of Modern Art (MoMA) last year – highlighting Scott Brown's contribution to Venturi's better-recognised career. In the same year, Scott Brown demanded for this contribution to be recognised by the Pritzker jury that awarded Venturi the coveted architecture prize in 1991. Although supported by prominent figures in the architecture community and Venturi himself, the organisation rejected the petition on the grounds that the way the jury is organised prevents it from making retroactive awards.